My time here has been pretty busy so far. Last week was spent between the hotel and the office, trying to do work and trying to sleep. My body had a hard time adjusting to the time zone this time. I am not sure why, but I think it has to do with the fact that I am working in an office with no window. Work had been ok. I am running into typical barriers, as I think I mentioned in my last post. I still have a lot of data to collect, and am running out of time. Today we went on a field visit, which was the first time I have been ‘outside’ of Dhaka. I say ‘outside’ because we really never left the city to get there. We drove for about an hour along a highway, and still it seemed like we were in the heart of a city. But as soon as you turn off the main road, all of a sudden you are in forested countryside and rice paddies. The driving itself was interesting. You never really go very fast, but it was a two lane road, and there were always trucks and auto-rickshaws to pass, which meant going into the lane of on-coming traffic. We went to visit the site of a demonstration project that we will be implementing. The project will involve training of industries, creating a database and helping to improve compliance with environmental regulations. We went to visit one textile plant, to see their effluent treatment plant. Textiles are a major industry in Bangladesh. Look in your closet and I guarantee you own something that was made in Bangladesh. But most of the textile plants, where textiles are weaved, dyed and manufactured, do not have treatment plants to treat their wastewater before dumping it in the nearest creek. This means that there is a lot of highly polluted water being dumped into the water bodies of the country. These water bodies are in turn where people catch their fish, collect their drinking water, and grow their rice. I saw streams and ponds of purple water, which was flowing straight towards the river. It is such a huge problem it is really daunting, and a bit depressing when you think that we are trying to help fix this problem, but only 6% of the factories that actually do have an effluent treatment plant actually use it at times other than when the inspector is coming. In our project area alone there are something like 200 industrial plants (textiles, brick kilns, pharmaceuticals, etc.). The trip was interesting, although I feel like I spent a large portion of the say stuck in traffic. 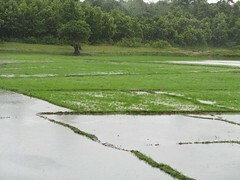 I did see my first glimpse of the countryside, and I saw my first ever rice paddy. It’s just too bad it was raining so much, or I’d have better photos to share!